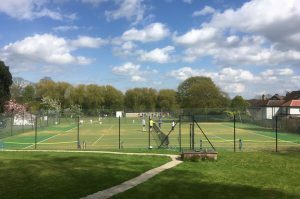 We run various mixed, men’s and ladies teams in the local tennis leagues. We also organise occasional friendly matches against other local clubs. We hope these FAQs will answer any questions you might have, but do get in touch if you want further information. And read our latest team news here. What teams does the club have? All our adult teams are for doubles play. We enter teams in the Leeds Tennis League and the Barkston Ash League through the summer season. We have 1 ladies team, 2 men’s teams and 3 mixed teams. 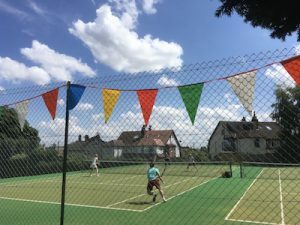 Leeds Tennis League: Our ladies team and 2 mens teams in this league consist of 2 pairs (total of 4 players) who play 2 sets against each of 2 opposition pairs. Barkston Ash League: Our mixed team in this league consists of 3 mixed pairs who each play 12 games against 3 opposition pairs (ie each pair plays 36 games). Totals are added up at the end and the club with the most games wins. We also enter 2 mixed team in the indoor league which runs through the winter months. Matches are played on Monday and Wednesday evenings from 8pm to 10pm at the Carnegie Indoor Tennis facility in Becketts Park. Each team consists of 4 players (2 men and 2 ladies) playing 2 mixed sets and 1 men’s/ladies’ set as per the medley format above. What time do matches start? All summer matches start at 6.30pm on weekdays or varying times on weekend days. A match lasts between 2 – 3 hours depending on how close the games are. Players would need to get to the courts by 6.20pm. What day of the week are matches played? Each team has an allocated home night which you can find on the website, away nights vary for each team. How often are matches played? Most teams play 10 to 12 matches through the season (beginning of May to beginning of August) so it works out at about 1-2 a fortnight but you don’t have to commit to all of them. If lots of people are interested and of the appropriate standard for a team, then matches may be shared around. So if other commitments mean you are only able to play a couple of matches that is ok, you could still get an opportunity. What standard do I need to be for team play? It’s hard to give a precise answer as it varies depending on annual promotion and relegation. However most match play is of a good to high standard. If you have played for a team before contact Penny Rice who can help point you in the right direction for the level of play you’re after. If you haven’t played in a team before/ aren’t sure if it’s for you but want to ask about it/ think you’re about the right standard but don’t really know, again email Penny. 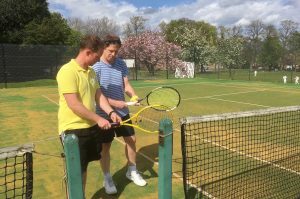 Our club coaches usually run some doubles tactics sessions for team players pre season. These sessions start in April and you don’t have to have a partner to come along. This would also be a good way of finding out if team play is for you and to get an idea of the standard required for the various teams. Contact the club coach for the next session. If I’m interested where do I start? Get in touch with Penny Rice (club chairperson) for more information.